On this blog, much has been made of the paucity of Ridley Scott’s films over the last fifteen years. For a director who once made Alien, Blade Runner and Gladiator, it is astonishing that Scott has made terrible film after terrible film since Gladiator was released in 2000. So going into The Martian, what was one to expect? Another terrible film to add to Scott’s bloated collection? Actually, nothing of the sort: a pleasant surprise. Mark Watney (Matt Damon) with the NASA crew, led by Melissa Lewis (Jessica Chastain, sitting down), before they go out to explore. The Martian is based on Andrew Weir’s 2011 novel with the same title. Mark Watney (Matt Damon) is exploring Mars with a NASA team, led by Melissa Lewis (Jessica Chastain). The team are out on the Red Planet when a freak storm occurs, knocking Mark away. Believing that he is dead, and fearing that the storm will destroy the team’s means of getting home, Melissa orders an evacuation. However, Mark is not dead and wakes up to find that the team have left Mars without him. Considering that the next NASA flight mission to Mars is not for another four years, Mark knows he’s going to be stuck on his own on Mars for a while. Yet, he only has enough food for a few months. So how will he survive? The sudden (contrived) storm that knocks Mark away. Part of the reason why The Martian is so good is because the desert scenery of Mars (or, rather, of Jordan, where the movie was filmed) is beautifully shot. Seeing the landscape of this foreign planet is as wondrous as any awe-inspiring place on Earth, as evidenced in The Way Back, True Grit, Sanctum and Macbeth, to name but four. Moreover, The Martian is an extremely interesting film. Our main character, Mark, is a (genius) botanist, and it is fascinating watching him carry out scientific experiments using natural elements in order to survive. But while the scenery is wondrous and the experiments are ingenious, The Martian would not have been half as engrossing without really good acting. Matt Damon has such a magnificent screen presence that he, alone (quite literally), can hold audiences’ attentions. Sean Bean is good as the honourable (Ned Stark-like) man, as is Chiwetel Ejiofor. Jeff Daniel’s is also decent as the NASA director, with the (legitimate) counter-arguments to Bean’s and Ejiofor’s suggestions. And, lastly, the crew (headed by Jessica Chastain) play decently enough with the little time that they’re given on screen. Assisting the cast, however, is a really good script, which ensures that The Martian surpasses recent, phenomenal space films such as Gravity and Interstellar. This is because the former was let down by a B-movie script, while the latter suffered from an incoherent storyline. The Martian, by contrast, has all the best elements of those movies, plus humour. The humour, in itself, warrants that viewers empathise with the characters and (cleverly) enables audiences to ignore the scientific technicalities if they don’t understand them. Upon waking up and returning to the base, Mark sits alone and wonders what he is to do. Not least, what will he do about food as his supplies are low? Scott gets a lot right with The Martian. Nevertheless, that is not to say that the movie is not without its faults. First, the storm at the beginning of the film is massively contrived to get the plot moving. And, second, the movie is predictable and the ending is an utter cliché. Yet, if these are the main flaws of the film, they are quite trivial, thereby emphasising just how well Scott has done with this movie. All-in-all, The Martian is a very entertaining film. It has no significant faults, it is innovative and it is funny. To think that the movie is predominantly about a man stuck on Mars on his own, trying to survive against the elements, underlines how impressive The Martian is. It also highlights that Ridley Scott still can direct excellent movies, despite his atrocious recent record. Let’s hope that The Martian can inspire Scott to cease making films of the poverty of Prometheus and Exodus, so that he can return to making films of the brilliance of Alien, Blade Runner and Gladiator. Ralph Fiennes – Harry Potter IV-VII(i) & VII(ii), Coriolanus, Wrath of the Titans, Skyfall, Hail, Caesar! What is the role of secret agents, and in particular, James Bond in the current era? Sir Ian Fleming, the author of the Bond novels, wrote Casino Royale in 1952. That was at the height of the Cold War between the USA and the USSR, when espionage involving personnel was at its zenith. But in 2015, the USSR no longer exists and espionage involving personnel has been downgraded due to technology. So, again, what is the role secret agents/James Bond nowadays? Spectre, Bond’s 24th outing, deals with this question in typical Bond fashion. James Bond (Daniel Craig), looking worn and tired after an eventful trip to Mexico, gets a dressing down from M (Ralph Fiennes) upon his return to London. Spectre opens up in Mexico City, wherein James Bond (Daniel Craig) acquires a ring bearing an octopus insignia. Upon returning to London, M (Ralph) demands that Bond explain what he was doing in Mexico. Bond refuses to explain, which leads to M indefinitely taking him off duty as a secret agent. Upon returning home, Bond re-watches a recording from his former superior, reminding him about a mysterious organisation called ‘Spectre.’ Despite having been removed from duty, Bond leaves London to unearth more about this shadowy organisation. Meanwhile, in London, M:I-6 has a new intelligence officer, C (Andrew Scott). C has his own plans to take M:I-6 forward; one of which is to dismantle the ‘00’ programme, putting him on a collision course with M.
Spectre, in many ways, is an archetypal Bond movie. Does it have a spectacular opening sequence? Yes. Is there a trademark song afterward it? Yes. Does Spectre have some witty (touché) dialogue? Yes. Does the film have a glamorous-looking cast along with breath-taking locations? Yes. Does the movie have some brilliant stunts, action sequences, and cool explosions? Yes. Does it have a weak storyline in which viewers have to suspend their disbelief to go through with it, without laughing at it? Absolutely! Therefore, Spectre delivers on its (formulaic) expectations for a Bond movie. Dr Madeleine Swann (Léa Seydoux), looking glamorous, joins Bond for dinner. However, in two ways, Spectre differs from most other Bond films. One, it makes enough references to other Bond films for it to be an homage to the Bond franchise; particularly, to those of the Craig era. And, two, Spectre is conspicuously slow-burning. Bond films tend to be fast-paced and filled with action to keep viewers interested during the supposedly less interesting parts of the film i.e. when Bond travels from one dazzling place to another, to find out information for the mission. Yet, at 150-minutes, Spectre has so much (often pointless) travelling that even the action sequences cannot keep viewers interested. In short, the movie needed to be cut by 30-45 minutes, especially during the middle hour where little happens. But because it has not been edited sufficiently, Spectre borders on boring at times, which is very unlike a Bond film. Nevertheless, during these ‘boring’ parts, one gets to explore a different (vulnerable?) side of Bond’s character; notably, whether James Bond actually enjoys being James Bond. Not only is this elucidated adeptly, but due to Daniel Craig’s aging appearance it seems entirely apt to have these questions raised. Indeed, Craig looks old and worn in Spectre, as if the strain of being Bond has taken its toll on him. Still, he is marvellous, tough and wryly humorous as Bond; probably more so than in Skyfall. Likewise, Ben Whishaw is a joy to watch as the funny and smart Q, as is Christolph Waltz as the mysterious, villainous Oberhauser; and as is Ralph Fiennes as the serious M. Léa Seydoux plays quite well, too, as Bond’s temperamental love-interest, Dr Madeleine Swann. Surprisingly, she has been given considerable character depth for a Bond Girl. Seydoux may lack chemistry with Craig on screen, but her character often drives Bond and the plot forward in interesting ways. Between her and Bond, and M and C), Spectre tries to intellectually tackle important questions that have become extremely relevant to Western politics since 9/11. Fascinatingly, the movie discusses the role of secret agents and technology, hinting at how times have changed since the Cold War; and how much power spy organisations should be given regarding the surveillance of ordinary citizens. Granted, Spectre only tackles these questions on superficial levels (and with answers that one could have guessed from a Bond film). But at least the movie brings up these questions. They also add a layer of depth to the storyline, which is always welcome. Over-all, Spectre is an all right James Bond movie. It is quite long, but fun and entertaining in ways that are reminiscent of so many other, previous films in the franchise. Nonetheless, Spectre differentiates itself from other Bond films by winking at fans with self-reference; by giving Bond and the other characters some depth; and, most notably, by trying to address complex issues that have plagued Western governments since the turn of the 21st-century. Spectre makes some valid arguments on the role of spies, technology, and the extent to which security organisations should be permitted to use surveillance in the current era. All of which enrich the Bond experience and will leave audiences thinking about them after the film has ended. The right to vote is an emotionally charged subject. In the UK, the right to vote is a birth-right for citizens of eighteen and above. But we must not forget that this was not always the case, and women had to fight harder to acquire this right. Maud (Carey Mulligan) working in the grimy laundry factory with her husband, Sonny (Ben Whishaw). At the turn of the twentieth-century, most men could vote in the UK but women could not. Rightly, this caused tension and gave rise to the Suffragette movement, headed by Emmeline Pankhurst. The Suffragettes used ‘direct action’ to bring attention to the injustice of women being unable to vote. Suffragette focuses on this movement, and the consequences these women suffered to bring the injustice of women being denied the right to vote to the forefront of the world’s attention. But, sadly, none of it is done particularly well. Suffragette is set in London between 1912-13. It is based around real events but our protagonist, Maud Watts (Carey Mulligan), is fictional. Maud works in a laundry factory, struggling to make ends meet. Appalled at the working conditions and the treatment of women by her boss, Norman Taylor (Geoff Bell), Maud joins the Suffragettes and gradually becomes more and more involved in the movement, despite the consequences of doing so. Suffragette is a surprisingly bland and uninteresting film. The movie starts off with a funereal drum beat, plus some misogynistic quotes from British politicians taken out of context. This sets the tone for a highly unsophisticated, puerile and uneventful outlook of the era and the movement. Alas, the film does not improve as it goes on. Worse, the film becomes sterile, making its 106-minute run time seem considerably longer. Maud at a demonstration for women’s right to vote with Violet Miller (Anne-Marie Duff, left) and Edith Ellyn (Helena Bonham Carter, right). 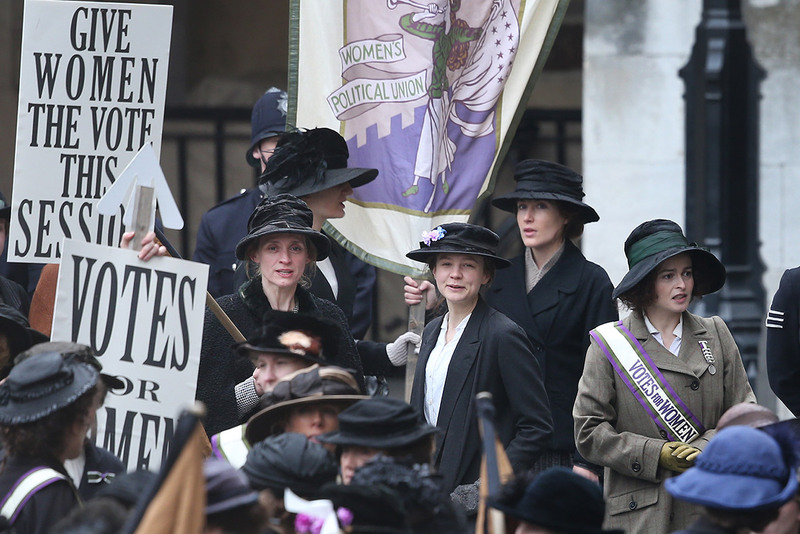 For all the film’s sterility, Suffragette grapples well (and not so well) with some of the issues plaguing the era. The film successfully shows us that conditions in factories were horrible back then; that people were much more patriotic back then toward the monarchy and the country compared to nowadays; that women, their offspring and their properties were controlled by their (abusive) husbands; that the Suffragettes adopted dubious, violent, and borderline-terrorist methods to get their message heard; and that the Suffragettes were treated harshly in prison. This gives us some insight into the mindset and workings of pre-World War I British society, which is interesting. But, alas, all of the above is tackled only at a shallow level in the film. Moreover, by the end of Suffragette, one learns little else about the era, other than that all the men were ignorant, misogynistic, lying, woman-beaters, and that all the women were heroines monolithically united in their struggle to get the vote. This is woefully unrepresentative of the era and unacceptably simplistic. If anything, this tells us more about script-writer Abi Morgan than about the era she wishes to portray. It is almost as if Morgan is more interested in imposing her opinions (propaganda) upon her audiences than portraying history fairly. Then again, this is not the first time that Morgan has imposed her views on viewers and portrayed history unfairly. She did it in The Iron Lady by riding roughshod over Margaret Thatcher. So should viewers really have gone into Suffragette expecting an honest portrayal of the Suffragette movement and the era, with Morgan having written the movie? The lack of objectivity in the film means that the cast of Suffragette have one hand tied behind their backs from the outset. In spite of this, however, Carey Mulligan, Helena Bonham Carter, Anne-Marie Duff and Natalie Press (who plays Emily Davison) all perform decently. Also, Meryl Streep puts in a solid cameo as the fire-brand Emmeline Pankhurst. 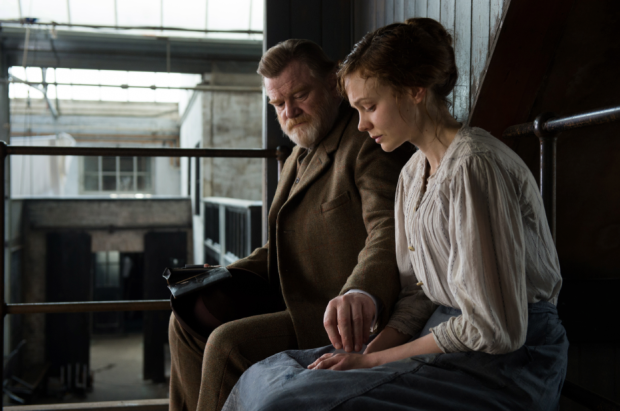 Maud being counselled in custody by Inspector Arthur Steed (Brendan Gleeson). Nevertheless, the cast are further let down by clunky dialogue and by the lack of depth in their characters. Both of these have the knock-on effect of rendering the cast unsympathetic and lifeless. And when a predominantly female cast comes across as unsympathetic and lifeless about a subject as emotive and justifiable as the right for women to vote, something is seriously wrong with the film. Over-all, Suffragette is a very disappointing movie. 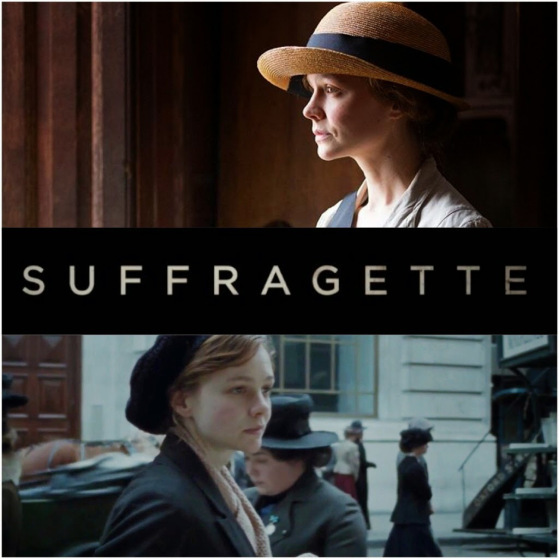 Yes, the film effectively highlights that women in the UK did not have the right to vote at the turn of the twentieth-century and that the Suffragettes brought the issue to the world’s attention with their antics. All the same, though, the film portrays the era and the Suffragette movement in an inexcusably one-dimensional, immature manner. Consequently, the movie is dull and if it wasn’t for the cast, the movie would have been duller still. Considering that the issue Suffragette deals with has such emotion behind it, it is stunning how little emotion Suffragette evokes. This is an injustice to the women (Suffragette or otherwise) who put their lives on the line back then to win the right to vote in the UK; and it is an injustice to all women in the world who still put their lives on the line to win such rights today.